Last weekend, Beat scheduled work meetings in Mountain View, which also coincided with our friend Liehann's birthday. Liehann has a 5-month-old baby, so for a present he requested the "gift of time" — a day-long ride on his favorite route over the Santa Cruz mountains. His wife, Trang, contacted us and proposed we make a trip to the Bay Area to join him, as a surprise. I haven't been back to the Silicon Valley since we moved away 20 months ago, so I was excited about the prospect. I miss this place. It's not that I want to move back. Really, I miss all of the places I've lived, and many I've only briefly visited. Nostalgia runs through my blood like oxygen. Each renewed memory is a breath of fresh air. Trang picked us up at the airport on Thursday night, after telling Liehann she needed to "pick up your present." I'm guessing he thought it was going to be something really cool like a new bike, but he still acted happy to see us when we walked in the door. We immediately launched into the 90-minute task to convert Liehann's somewhat neglected bikes into workable machines. 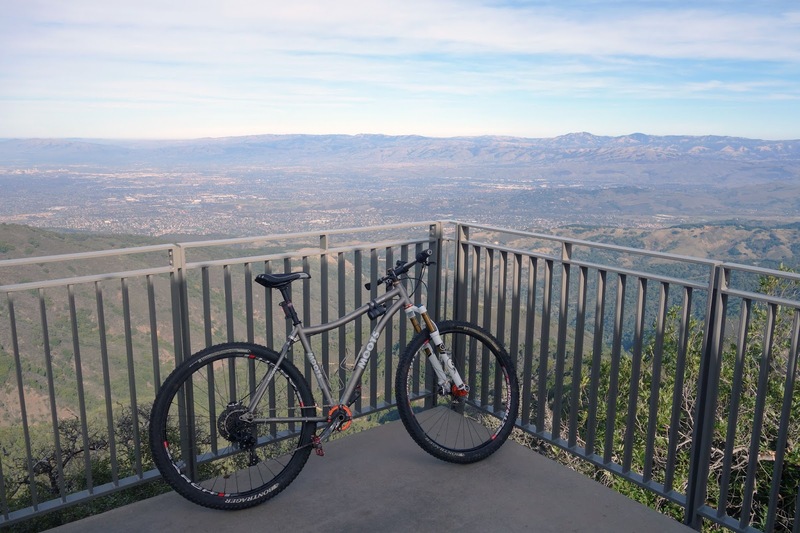 I claimed his Moots, which is just like my bike, only larger, with subtly different features. A poor choice of a cheap saddle notwithstanding, Stranger Moots and I quickly bonded. 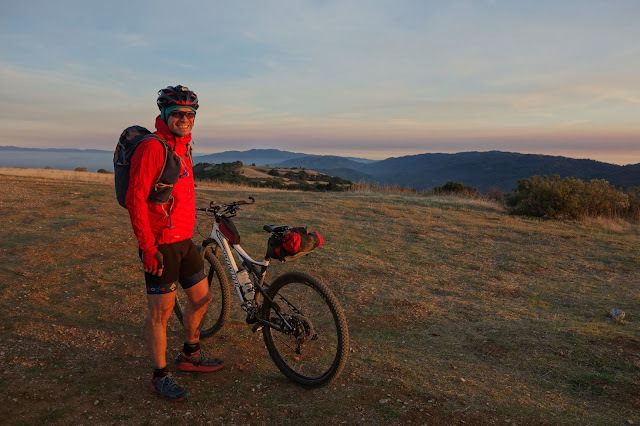 Within a mile of leaving Liehann's house Friday morning, I felt like I was riding my own beloved mountain bike alongside heavy traffic on De Anza Boulevard, just like old times. My destination was Mount Umunhum, one of the taller summits in the Santa Cruz Mountains at 3,500 feet. It's home to a defunct air force radar surveillance tower known to locals as "The Cube." This peak was closed to the general public for decades because of hazardous material concerns and access disputes. But its distinctive landmark made this mountain particularly enticing. Whenever I rode through Sierra Azul, I would stare up at the looming monolith and ponder the possibility of secret trails. In 2013 I attended a Mid-Peninsula Open Space District meeting to advocate for bike access, and learned that MidPen was developing the area for a planned opening in 2017. "Ugh, we have to wait four years?" I remember thinking. And, "I hope I'm not still here in 2017." (I moved to California with low expectations, and my appreciation and love continued to grow throughout the years.) 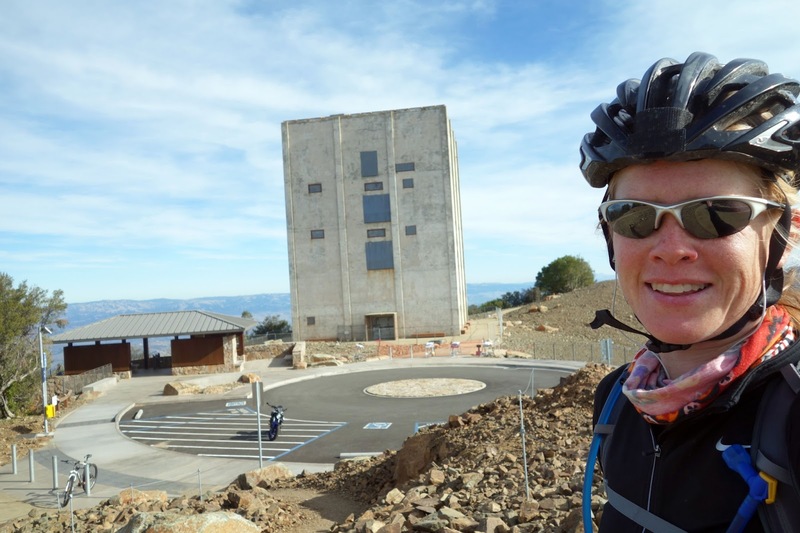 When Umunhum finally opened in September 2017, I scrolled through California friends' social media posts and felt tinges of jealousy. Friday was a beautiful day for a visit. Temperatures were in the low 70s, and it felt truly strange to ride a bike through a space absolutely devoid of wind. Despite warnings about popularity and crowds, there was almost no one on the road or at the summit. The weirdness of The Cube did not disappoint. I hiked a spiraling trail to the true summit and sat on a rock, eating one of three Nature Valley bars I'd packed for a 55-mile, 6-hour ride. (I'd left the house with the wrong perception of Unumhum's proximity to Sunnyvale.) Then I hopped on MidPen's new trail for the long descent. It's a buffed-out wheelchair ramp ... and I loved it, so much. I do miss the flowing ease of California trails. On Saturday morning we were up at the crack of dawn to squeeze in Liehann's long birthday ride before his friends arrived for dinner. As a new father who also recently took on a tough new project at work, his riding for the past several months has amounted to occasional commutes to the office. So you could say he was fairly undertrained, but enthusiastic. 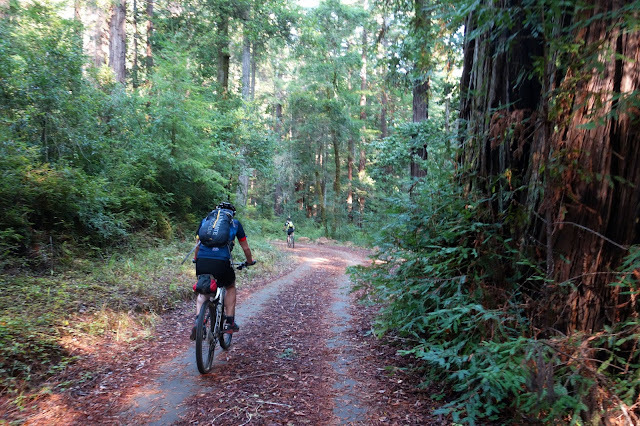 We set out for the route we often used while training for our long bike adventures, the "Big Basin Big Loop" — which Strava tells me I only rode 10 times during my five years in the region, but in my memory it's dozens. Morning temperatures hovered near freezing, and a thick coat of frost clung to grass in the shade. (Geez, there's more snow here than there is in Boulder, I mumbled at one point.) It was interesting to observe the altered shape of Stevens Creek Canyon after last year's flooding — not-subtle reminders that change is constant. 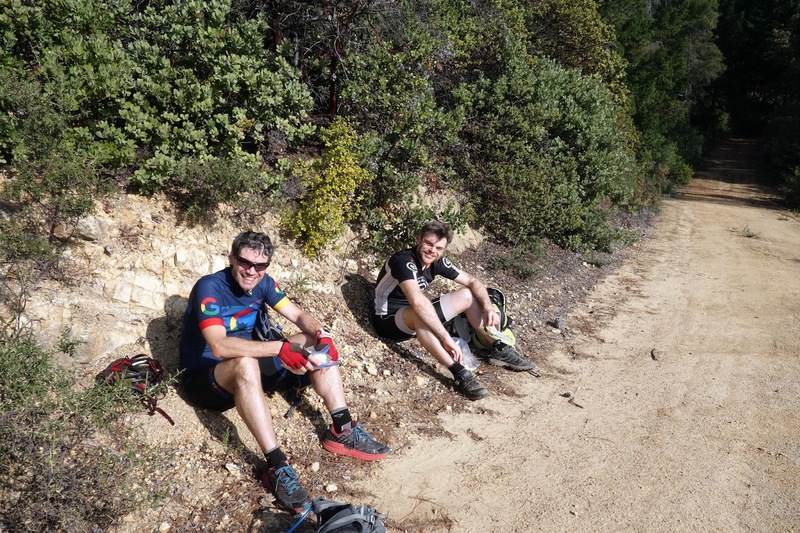 We stopped for lunch at the exact corner in Big Basin that at some point had been designated the lunch spot. Trang made delicious rice squares for snacks, and after grabbing a share, I somehow managed to forget all of the other food I intended to bring. The lunchtime assessment of my supply revealed I was working with about 1,000 calories, which probably would have been fine had I not already felt a bit depleted from not carrying enough food the previous day. I felt pretty silly about the oversight, and thought I could get by rationing my food. But after several more hours I felt dizzy, and swallowed my pride to beg for fruit snacks from Beat. Besides the bonk, I had a good day. For that I can probably credit the low altitude, although I like to think I'm gaining a better grasp on my breathing again. When my breathing remains steady, my muscles feel stronger, my head is clearer, and I'm an all-around happier person. Strava would again reveal that, no, I'm not quite as strong here as I was two years ago. Right now, though, there's more inherent value in simply feeling something resembling strength. After Beat gave me snacks, I felt like I could breathe fire and sprint up a mountain. Beat pushed a tough pace for most of the 85-mile ride and Liehann held on like a champion, only slowing near the top of the grueling climb up West Alpine. He still agreed to a longer trail diversion to the top of Black Mountain, another favorite spot for Beat and me. We were lucky to arrive right before sunset, and watch the sky light up over the Pacific. More snacks were consumed, and everyone was giddy. As we rolled home in the fading light, Liehann demonstrated his impeccable luck by sustaining the day's first mechanical — a flat tire — on the only bike of his that sees regular maintenance. But it was quickly remedied, and we returned just in time for birthday dinner — an interesting fusion of French raclette, Vietnamese barbecue, and chocolate fondue for dessert. A great day. Beat and I had one more day in town, so on Sunday we set out to visit the 1,200-year-old Coast Redwood called Old Tree. Although not necessary, we like to start this pilgrimage from Long Ridge, and descend deep into the frosty canopy of Portola Redwoods State Park. This afforded my third view of the Pacific for the weekend, and my third gasp at the sweeping expanse of blue. We often describe ourselves as "mountain people" or "ocean people" and I'm definitely the former, but miss the ocean all the same. This quiet grove is one of our favorite spots in the region. There's a reverence surrounding Old Tree, that unspoken wisdom of the ages extending beyond our meager lifetimes. I love touching the gnarled bark of Old Tree and imagining the centuries it has witnessed, the storms and fires and floods it has endured, and the unlikely way it survived the aggression with which humans reshaped this land. Sometimes I trick myself into the superstition that I can stand beneath this 300-foot-tall giant and absorb some of its power of rejuvenation — a kind of healing wish. Always I see in Old Tree some hope for the future, that even as everything changes, beauty endures. 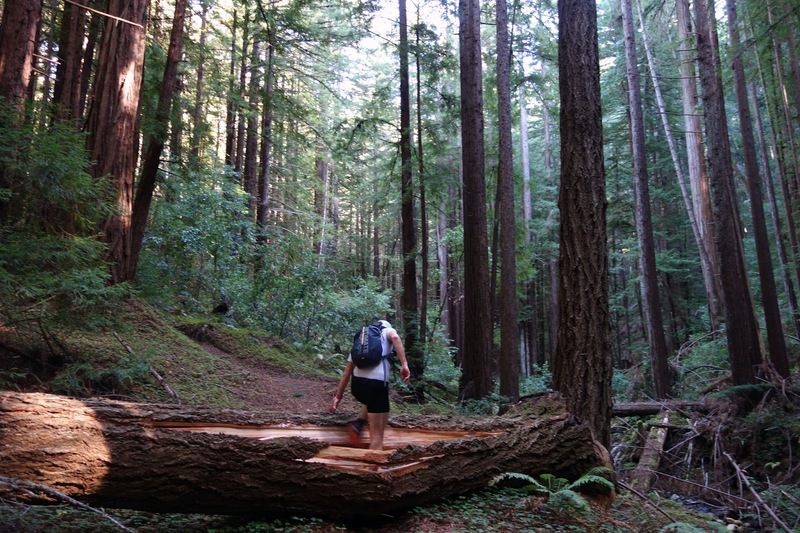 The run (cough, hike) out is a rewarding slog — a redwood forest obstacle course punctuated by a steep and sun-exposed fireroad climb that always feels like the surface of an oven, even in December. After 15 miles of this, my quads were nicely battered — and as has been the case recently, I was ecstatic to feel the effects of hard efforts that have nothing to do with my lungs. Almost unintentionally, it turned into a hard-effort weekend and a "best of" tour of my old stomping grounds. I hope to carry all of this good energy into the near future. Haven’t been to the box yet, partially as a silent protest against MidPen who are despised by the mountain biking community here for turning trails into wheelchair ramps. May be worth a climb though. Glad you had good times in Cali! Right now we have similar controversy in Boulder, as the Boulder Mountain Bike Alliance is using a $40,000 grant to rebuild trails in West Mag. They've been clearing trees and widening corridors to make more room for banked turns and better flowing trails, so of course the "real" mountain bikers of Nederland are complaining about BMA ruining the character of the trails. I can see their side, but I can't relate. 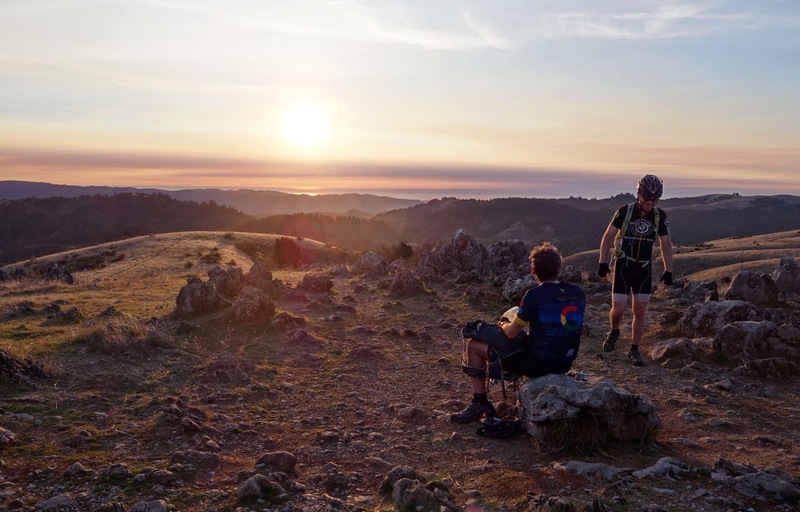 I've already accepted that I'm not a "real mountain biker" and probably never was (well, maybe that one year I lived in Montana, before the confidence-destroying crash that ripped open my elbow in 2011, and subsequent years of endless clumsiness.) These days, technical riding attempts only happen in small doses before I become irritable. I love a fast, flowing, mindless wheelchair ramp. Seems BMBA is doing the right thing. Flow trails are awesome. MidPen removes rocks and roots and puts gravel on trails, so people can go faster, equals more complaints from hikers, finally they ban bikes. 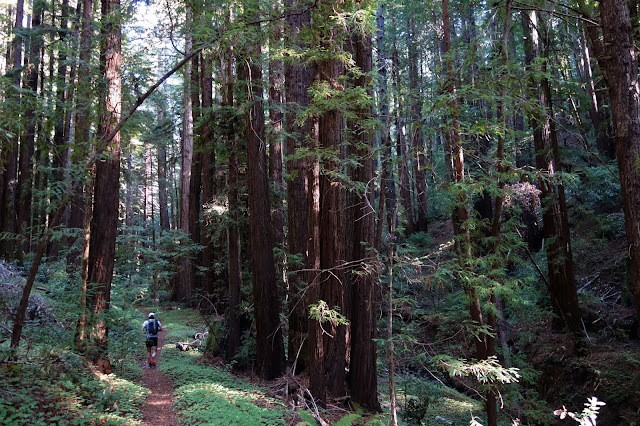 There should be trails for everyone. 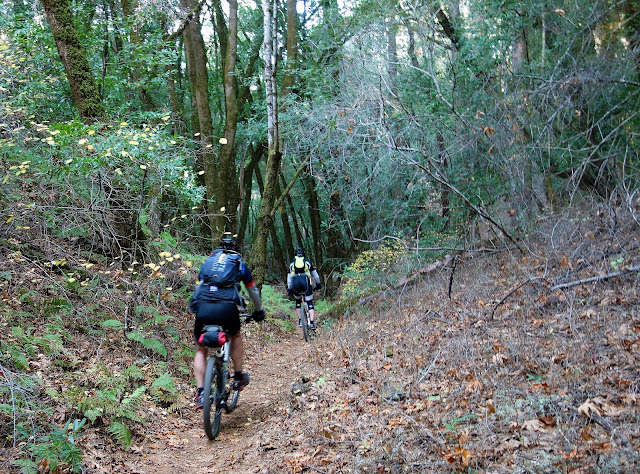 Our singletrack options are Tahoe, Downieville, Mendocino. Thanks god for those! I'm glad you got to do all that on your return. 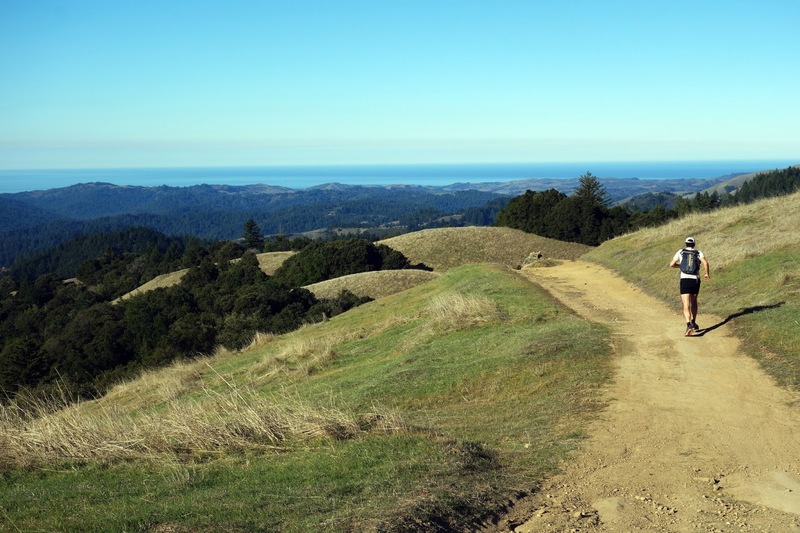 I commented in your previous post that you should check out Umunhum and the redwoods and turns out you had it all planned. As a Midpen volunteer I've been fortunate to have worked on the summit and trail the last few years, so happy you could enjoy it. I assume the old tree was at the bottom of Peter's creek loop in Portola. I saw your comment on Sunday night and smiled, because you had all the same ideas I had. 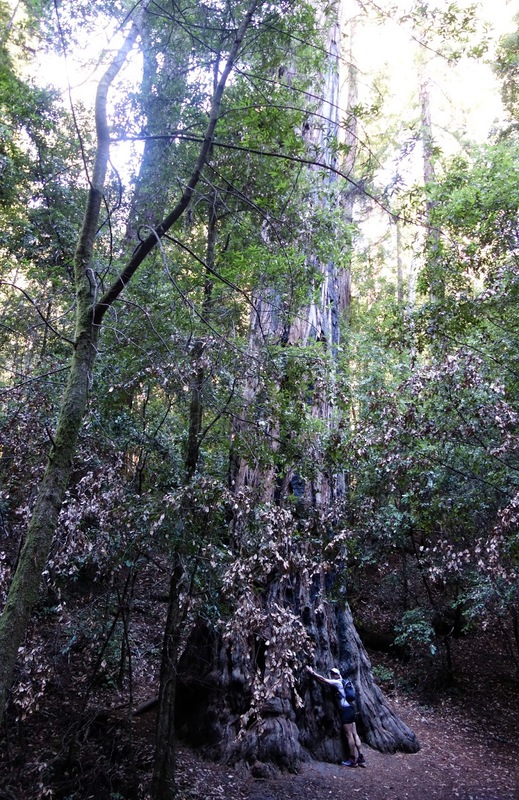 Old Tree is in the main part of Portola, just a half mile from the campground. We still take the "long way" because it feels more meaningful (and also makes for a nice long run.) 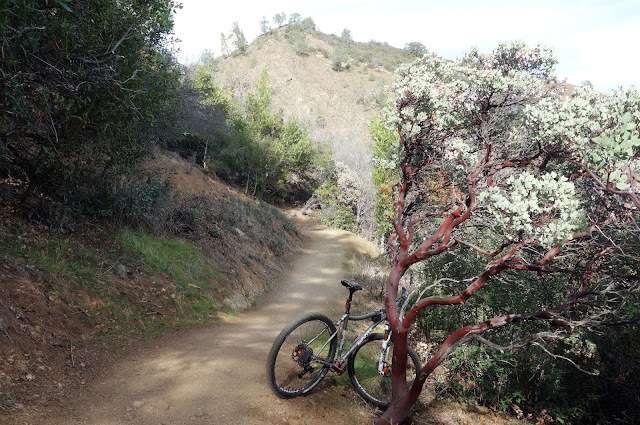 We've also been to Peters Creek loop a couple of times, but poison oak proliferation has left us a bit reluctant to return. Thanks for all your work on Umunhum! The trail turned out great. I met a nice ranger along the way. He caught me just after I took that photo and made a real clumsy move while retrieving my bike, and dropped a bar wrapper that he picked up. Embarrassing! But he was nice about my littering. We had a good chat. I love the name Umunhum! I don't know how it's pronounced, but it my head it sounds like someone couldn't remember the real name (um...uh...um) or maybe kind of like M&M, but upside down. 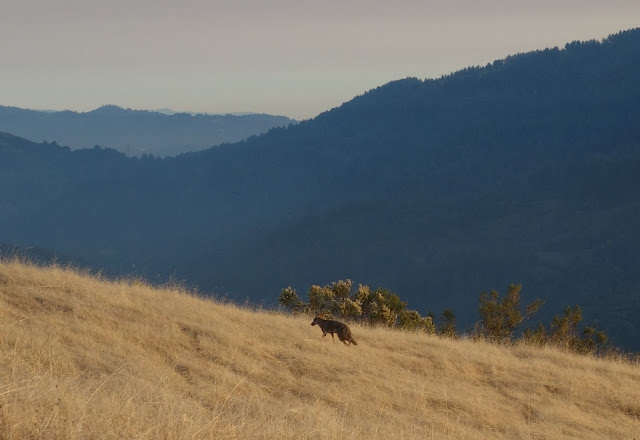 So, was that a coyote on that brown, grassy hillside? Umunhum is supposedly a native American word that means resting place of the hummingbird. Basically people pronounce it with the h silent. I've read the native pronunciation is ooo-moon-noon. Anyway with it's prominence in the mountain range, birds and butterflies migrating do stop up there. I've also seen many dragonflies up there too. Jill, we planted 1200 plants native to the summit recently, so if you visit again in the future you'll see lots of flowers coming out of all those rocks. That was a coyote. "Umunhum" is an Ohlone word. Usually when I hear it spoken it's pronounced "Um - un - um" (almost like someone saying "nom nom nom," but Tom offered an interesting pronunciation. Tom, I'd love to view your photos, but I tried that link and got a 404 message. Do you have another? If you get on there the most recent ones are on the photostream. 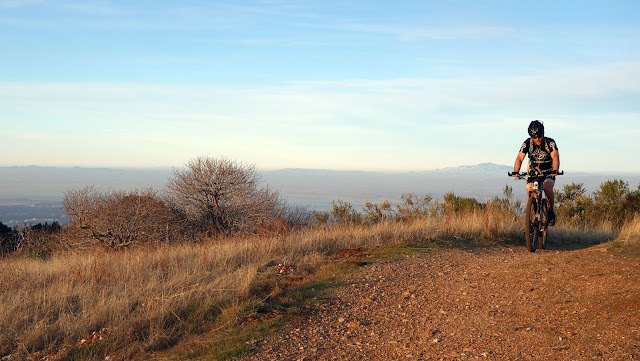 If you click on albums, there is a mt Umunhum album where I have ones from years ago when there were buildings up there and I have photos of some of the unique flora off the side of the mountain.I used to get special access by rangers who I worked with. Thanks Jill and Beat for the visit! It was wonderful to see you again and it was great to briefly have broken bikes and sore bodies be the only things to worry about! I don't know how I'll fit it in, but 2019 is on the calendar for another race. Maybe I can entice you into riding something epic again? Jill, why didn't you tell us sooner you were low on food? I'm sure between us we had plenty! Just as well though as I was getting pretty bonky myself up West Alpine and you already left me in the dust. :-) Fortunately I recovered well up Black Mountain and felt good by the time we got home. No way I was going to miss sunset on top of Black Mountain! Also what would big Jill rides be without insufficient calories. Pencil the ride in again for next year. Maybe we can convince Jan to come with us!